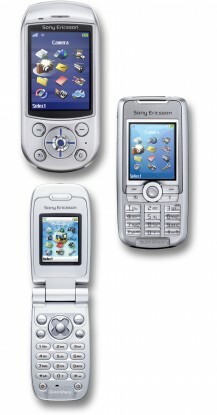 S700: Swivel-style tri-band model with 1.3 megapixel camera and QVGA screen supporting 262,000 colors. Also features Memory Stick Duo slot, Bluetooth, and MP3 player. Available Q4 2004. K700: Bar-style tri-band model featuring VGA camera with flash, video recording, 32MB of memory, hi-res TFT display, MP3 player, and FM radio. Available Q2 2004. Z500: Clamshell tri-band (850/1800/1900) model with EDGE (class 10), dual color displays, VGA camera with video recording, Push-To-Talk (PoC), and user-changeable covers. Available in the Americas in Q3 2004. T637: Bar-style tri-band (850/1800/1900) model based on the T630, adding Push-To-Talk (PoC). Features include TFT display, camera, and Bluetooth. Available for the Americas in "Liquid Black" in Q2 2004. T237: Entry-level, dual-band bar-style model with 4,096-color display, voice dialing, and 32-chord polyphonic ringtones. Available in "Blade Grey" for the Americas in Q2 2004.